A library database is a searchable collection of information. 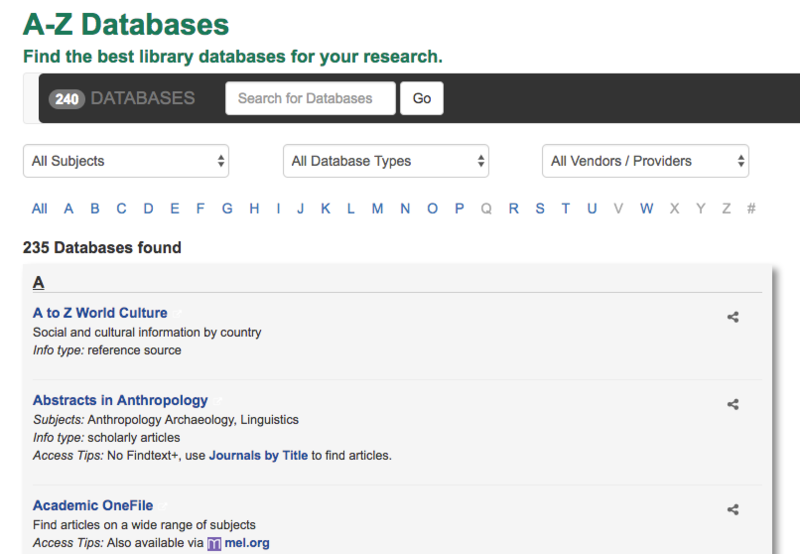 The library subscribes to many databases, which are provided by various companies such as ProQuest, EBSCO, etc. Each database contains specific types of information--this is often referred to as a database's coverage. A database's coverage usually limits by the type of material (e.g., articles, video, artwork), the field of study, time periods, or language. Coverage notes can be found below the database's title on the A-Z Databases page. Interactive tutorial that explores what a database does, how to use databases, why there are so many databases, what can databases do and which to use. Contains exercises. Designed to be completed in ~10 minutes. Featured in ACRL PRIMO; winner of the Blackboard Catalyst Award. Copyright of the University of Manchester (they do allow adoption and adaptation with permission). Developed in Articulate Storyline.